Saint-Germain-l’Auxerrois is located just south of the Louvre. It was the former parish of the kings of France and was known as the Church of the Louvre. The church was originally founded in the 7th century and was rebuilt many times. In 1572, the church bell sounded, which started the St. Bartholomew’s Day Massacre in which thousands of Huguenots visiting the city for a royal wedding were killed by a mob. 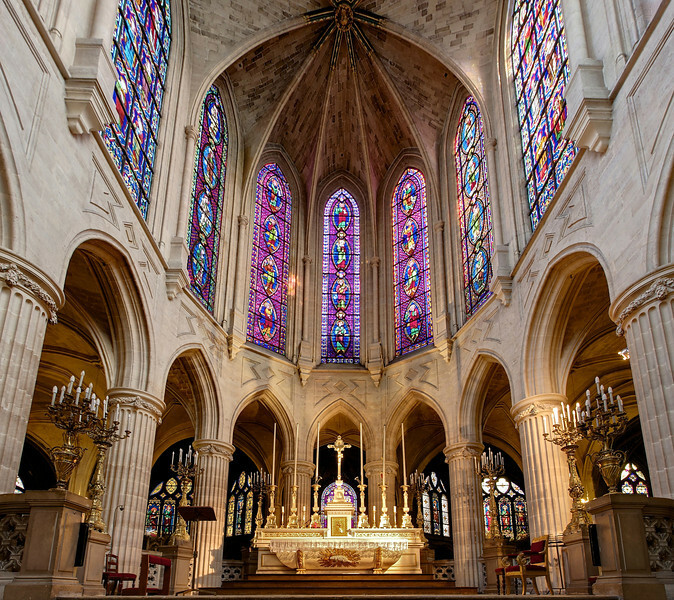 Like most churches, Saint Germain-l’Auxerrois was damaged during the revolution; fortunately, the wonderful stained glass survived. The church was “made to the Catholic faith in 1802” according the to the church website. Major restoration work began in 1837 after riots caused significant damage. Popular culture trivia: actress Eva Longoria and basketball player Tony Parker were married here in 2007.